* Senior club appearances and goals counted for the domestic league only and correct as of 23:00, 27 November 2016 (UTC). Leighton John Baines (born 11 December 1984) is an English professional footballer who plays as a left-back for Premier League club Everton and the England national team. Baines started his career with Wigan Athletic, and was part of the team that won the Second Division in the 2002–03 season and was a runner-up in the 2004–05 Championship and the 2006 League Cup Final. He joined Everton in 2007, helping them reach the 2009 FA Cup Final. He has played for England at under-21 and senior levels. Baines was included in the England squads at UEFA Euro 2012 and the 2014 FIFA World Cup. 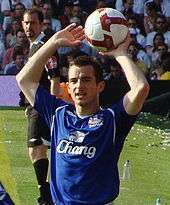 Baines made his debut for Wigan Athletic in 2002, and was a member of the team that won the Second Division in the 2002–03 season. He was a regular in the first team when Wigan earned promotion to the Premier League in 2004–05. That season saw Baines score his first goal for the club, a long-range shot against Ipswich Town. When he secured promotion with Wigan, he doubted he was good enough to play in the Premier League: "We won promotion to the Premier League and, straight away, I was thinking, 'Where am I going to go now?' I should have been celebrating but I spent a large part of that summer worrying about what it would be like spending the next year on the bench and in the reserves." Baines signed a new contract with Wigan in February 2005 despite being linked to a number of Premier League clubs, including Manchester United, Arsenal and Everton, and extended his contract again after impressive displays in his first season in the Premier League. Whilst at Wigan he started in the 2006 League Cup Final defeat to Manchester United. In July 2007, Baines rejected a move to Sunderland, after their bid of a reported £6 million was accepted by Wigan. In the following month he signed for Everton for an initial fee of £5 million, with another £1 million in add-ons, dependent on Baines's appearances for Everton. Baines did not play regularly in his first season, making just 29 appearances in all competitions, due to an injury and the good form of Phil Jagielka and Joseph Yobo at centre back which kept Joleon Lescott at left back. His second season at Everton saw an increase in Baines's playing time. Due to an injury to Yobo, Lescott moved to the centre of defence and Baines played at left back. He was voted Player of the Month at Everton two months in a row in the 2008–09 season. Baines scored his first ever Everton goal against Portsmouth on 21 March, at Fratton Park, after 57 games (in all competitions) without scoring. On 30 August 2009, he scored a last minute penalty in a 2–1 win over his former team Wigan. A month later, he captained Everton for the first time in a UEFA Europa League match against AEK Athens. In the 2010–11 season, Baines played every minute of Everton's Premier League games, as well as scoring seven goals in all competitions. His contribution was rewarded with the club's Player of the Season, Players' Player of the Season, and Goal of the Season awards. His goal against Chelsea, scored from direct free kick, was voted Everton Goal of the Season. He also contributed 11 assists throughout the season, 5th overall in the league, and was the league's highest assisting defender. Baines scored five times during 2011–12, four of which were penalties. He reached 99 consecutive league games before ending his season early due to injury. His performance at left back was deemed impressive enough to be named in the PFA's Premier League Team of the Year in 2012, the first Everton player to do so for 22 years since Neville Southall in 1989–90. 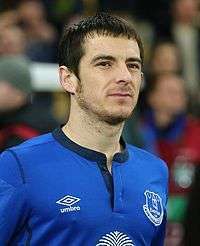 During the 2012–13 season, Baines created 116 chances for his teammates, more than any other player in Europe's top five leagues. When 2013's PFA Premier League Team of the Year was announced, Baines was again included, and he also won Everton's Player of the Season and Players' Player of the Season awards. Baines was the only outfield player to have played in every minute of every Premier League game during the season. He was the subject of multiple bids during the 2013 summer transfer window from Manchester United but all were rejected by Everton. Baines scored two free-kicks either side of goalkeeper Jussi Jääskeläinen from the same position as Everton beat West Ham United 3–2 in September. He was only the fifth player since 2006–07 to score two direct free-kicks in one Premier League game (after Rooney, Ronaldo, Drogba and Larsson). Baines suffered a toe injury in November which saw him miss a top flight fixture for the first time in 52 games. On 27 January 2014, Baines signed a four-year deal to extend his contract at Everton. He scored three penalties during the season to take his career tally to 13, becoming the first player in Premier League history to have taken more than 10 and never missed one. The 13th came on his 300th appearance in the competition in a 2–0 win over Manchester United. Baines scored five goals and assisted four others during 2013–14, the most of any defender in the league. He scored his first ever goal in European football for Everton on 18 September 2014, netting from the penalty spot in a 4–1 win over Wolfsburg in the first match of their UEFA Europa League campaign. On 5 October 2014, his penalty against Manchester United was saved by David de Gea. This was the first time he did not score from a penalty in the Premier League. 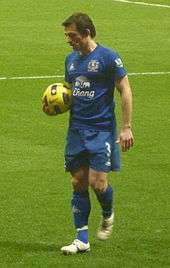 In January 2015, Baines made his 45th assist in the Premier League to overtake Graeme Le Saux as the defender with the most in the division's history. Baines missed the beginning of 2015–16 after injuring his ankle in training just before the Premier League started. Baines made his debut for the England under-21s in a 2006 UEFA European Under-21 Championship qualification away to Austria in September 2004 under Peter Taylor. In the following campaign Baines scored a vital goal for the England under-21 team against Germany on 6 October 2006, securing a 1–0 win in the first leg of a UEFA European U21 Championship play-off. He played all four of England's matches in the 2007 UEFA European Under-21 Championship finals. In total he played 16 times for the under-21 team and scored one goal. With Wayne Bridge retiring from international duties, Baines was called up to the senior England squad for the first time in March 2009, and made his full international debut in a friendly against Egypt at Wembley Stadium on 3 March 2010, playing the full 90 minutes of a 3–1 win for England. He was selected in a provisional squad of 30 players for the 2010 FIFA World Cup, but did not make the final squad of 23 players to be taken to South Africa, with Aston Villa left-back Stephen Warnock, who had not played in the warm-up games, taken in his place. Baines made his competitive international debut on 4 June 2011, replacing the injured Ashley Cole in a Euro 2012 qualifier against Switzerland, assisting Ashley Young for England's equalising goal. Baines was named in Roy Hodgson's squad for Euro 2012 in May, but did not feature in the tournament with Hodgson using Ashley Cole for all four of England's games. In September 2012, he scored his first international goal against Moldova in a 2014 World Cup qualification match, a deflected free kick which was the last of England's goals in a 5–0 win. On 30 May 2014, Baines' corners in a Wembley friendly against Peru led to two of England's goals in a 3–0 win. Baines is described in his UEFA.com profile as a "dependable left back" who is "best known for his set-piece expertise and penalties". But in his early years, Baines played in midfield and attack; it was only when he started at Wigan that he began to play in the left back position. 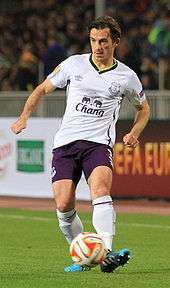 Roberto Martínez had planned to redeploy Baines as a midfielder, in a similar change to Philipp Lahm. Baines has stated that he would be "excited to give it a go". Baines was born and raised in Kirkby, Merseyside. He began playing football at a local Liverpool primary school but, age 10, had trouble playing for a Sunday League team because he was shy. He has three children with his wife, Rachel. Baines is a close friend of musician Miles Kane, and is himself a keen guitarist. Baines was educated at St Joseph The Worker Catholic Primary School and All Saints' RC High School in Kirkby. In May 2014, on the eve of the 2014 FIFA World Cup, Baines suffered personal tragedy when his 81-year-old grandmother Ann Baines died after falling down the stairs in her home. He subsequently dedicated his World Cup performances to her memory. As of match played 27 March 2015. England score listed first, score column indicates score after each Baines goal. 1 2 Hugman, Barry J., ed. (2010). The PFA Footballers' Who's Who 2010–11. Edinburgh: Mainstream Publishing. p. 29. ISBN 978-1-84596-601-0. ↑ "Player Profile: Leighton Baines". Premier League. Retrieved 16 May 2016. ↑ Taylor, Daniel (29 September 2007). "Baines thriving after test of his fragile nerve". The Guardian. London. ↑ "Baines commits to Latics". Sky Sports. Retrieved 23 September 2006. ↑ "Baines rejects Sunderland switch". BBC Sport. 25 July 2007. Retrieved 25 July 2007. ↑ "Baines joins Everton". Sky Sports. Retrieved 6 August 2007. ↑ "Everton capture Baines from Wigan". BBC Sport. 7 August 2007. Retrieved 7 August 2007. ↑ "Everton revived on Europa League stage". UEFA. 17 September 2009. ↑ Doyle, Paul (26 May 2011). "Number-crunching makes grim reading for Arsenal's defence". The Guardian. London. Retrieved 26 May 2011. ↑ "Baines' Glorious Treble". Everton F.C. 20 May 2011. Retrieved 20 May 2011. ↑ Hunter, Andy (19 April 2012). "Everton's Leighton Baines hamstrung but should be fit for Euro 2012". The Guardian. London. Retrieved 23 April 2012. ↑ "Arsenal's Robin van Persie is honoured to win PFA player of year award". The Guardian. London. 23 April 2012. Retrieved 23 April 2012. 1 2 "Chelsea defeat epitomises the season for Everton". ESPN FC. Retrieved 19 May 2013. ↑ Cass, Simon (8 April 2013). "Forget Messi and Ronaldo, it's Premier League defender Baines who creates more chances than anyone in Europe". Daily Mail. London. Retrieved 19 May 2013. ↑ Riach, James (29 April 2013). "Tottenham's Gareth Bale wins PFA player of year award for second time". The Guardian. London. Retrieved 30 April 2013. ↑ "Baines Named Player of the Season". Everton F.C. Retrieved 19 May 2013. ↑ Bascombe, Chris (4 September 2013). "Everton keen to reward Leighton Baines with new deal". The Daily Telegraph. London. Retrieved 5 September 2013. ↑ Ryan, Mark (21 September 2013). "West Ham 2 Everton 3: Lukaku on debut and two stunners from Baines see off Hammers in thriller". Daily Mail. London. Retrieved 21 September 2013. ↑ "FourFourTwo". Retrieved 14 November 2013. ↑ "Deulofeu needs to keep playing with a smile – Martinez". Liverpool Echo. Retrieved 2 December 2013. ↑ "Leighton Baines: Everton defender signs new deal with club". BBC Sport. 27 January 2014. Retrieved 27 January 2014. ↑ "Everton's Leighton Baines Scores Record 11th Premier League Penalty". The Huffington Post. New York. Retrieved 26 May 2014. ↑ "Champs minus blanks". Sky Sports. Retrieved 26 May 2014. ↑ "MW37 stats: Liverpool set away goals mark". Premier League. Retrieved 26 May 2014. ↑ "Everton marked their Europa League return with a dominant victory over Germans Wolfsburg at Goodison Park.". BBC Sport. 18 September 2014. Retrieved 18 September 2014. ↑ "Leighton Baines misses first penalty of his Premier League career.". The Independent. London. 5 October 2014. Retrieved 5 October 2014. ↑ "Leighton Baines is the defender with most assists in Premier League history – who joins the Everton star?". Daily Mail. London. Retrieved 14 January 2015. ↑ "Everton's Leighton Baines has ankle surgery, out 12 to 14 weeks". ESPN FC. 14 August 2015. Retrieved 14 August 2015. ↑ "The boy's a bit special". FourFourTwo. December 2004. ↑ "Everton star Leighton Baines eager to make the most of Wayne Bridge's England snub". Daily Mail. London. 2 March 2010. ↑ McNulty, Phil (3 March 2010). "England 3–1 Egypt". BBC Sport. Retrieved 4 March 2010. ↑ "Capello names surprise Cup squad". BBC Sport. 11 May 2010. ↑ "World Cup 2010: Walcott left out of England squad". BBC Sport. 1 June 2010. Retrieved 1 June 2010. ↑ Bernstein, Joe (16 January 2011). "It's not for kids! Leighton Baines axed from World Cup squad by Fabio Capello outside toy shop". Daily Mail. London. ↑ "England Euro 2012 squad: Ruddy, Carroll & Defoe in, Ferdinand out". BBC Sport. 16 May 2012. Retrieved 19 May 2012. ↑ "England Squad". UEFA. Retrieved 16 August 2012. 1 2 McNulty, Phil (7 September 2012). "Moldova 0–5 England". BBC Sport. Retrieved 20 April 2016. ↑ "England 3–0 Peru". BBC Sport. 30 May 2014. Retrieved 30 May 2014. ↑ King, Dominic (30 April 2011). "Leighton Baines: I'm not afraid of anyone, but I had to run from Liam Gallagher". Daily Mail. ↑ Bascombe, Chris (2 May 2014). "Leighton Baines: Why I stayed at Everton but feel 'gutted' for David Moyes after Manchester United sack". The Daily Telegraph. London. ↑ "Leighton Baines". Liverpool Echo. Retrieved 20 April 2016. ↑ Maddock, David (9 May 2009). "Everton's Leighton Baines turned to his family in dark times". Daily Mirror. London. Archived from the original on 31 December 2013. ↑ Lawton, Matt (2 December 2006). "The Fear of Failure That Is Driving Baines On". Daily Mail. London. Retrieved 3 March 2010. ↑ Lutz, Tom (3 March 2010). "England v Egypt – as it happened". The Guardian. London. Retrieved 3 March 2010. ↑ Lawton, Matt (2 December 2006). "The fear of failure that is driving Baines on". Daily Mail. London. Retrieved 2 January 2013. ↑ Jacques, Adam (10 February 2013). "How We Met: Leighton Baines & Miles Kane". The Independent. London. ↑ Andrew, James (10 January 2013). "You might think all footballers listen to R&B... but some of us like decent music, says Everton star Baines". Daily Mail. London. ↑ "Baines Goes Back to School". Everton in the Community. Retrieved 22 August 2014. ↑ Traynor, Luke (27 May 2014). "England star Leighton Baines hit by personal loss ahead of World Cup in Brazil". Daily Mirror. London. ↑ "Games played by Leighton Baines in 2001/2002". Soccerbase. Centurycomm. Retrieved 20 April 2016. ↑ "Games played by Leighton Baines in 2002/2003". Soccerbase. Centurycomm. Retrieved 20 April 2016. ↑ "Games played by Leighton Baines in 2003/2004". Soccerbase. Centurycomm. Retrieved 20 April 2016. ↑ "Games played by Leighton Baines in 2004/2005". Soccerbase. Centurycomm. Retrieved 20 April 2016. ↑ "Games played by Leighton Baines in 2005/2006". Soccerbase. Centurycomm. Retrieved 20 April 2016. ↑ "Games played by Leighton Baines in 2006/2007". Soccerbase. Centurycomm. Retrieved 20 April 2016. ↑ "Games played by Leighton Baines in 2007/2008". Soccerbase. Centurycomm. Retrieved 20 April 2016. ↑ "Games played by Leighton Baines in 2008/2009". Soccerbase. Centurycomm. Retrieved 20 April 2016. ↑ "Games played by Leighton Baines in 2009/2010". Soccerbase. Centurycomm. Retrieved 20 April 2016. ↑ "Games played by Leighton Baines in 2010/2011". Soccerbase. Centurycomm. Retrieved 20 April 2016. ↑ "Games played by Leighton Baines in 2011/2012". Soccerbase. Centurycomm. Retrieved 20 April 2016. ↑ "Games played by Leighton Baines in 2012/2013". Soccerbase. Centurycomm. Retrieved 20 April 2016. ↑ "Games played by Leighton Baines in 2013/2014". Soccerbase. Centurycomm. Retrieved 20 April 2016. ↑ "Games played by Leighton Baines in 2014/2015". Soccerbase. Centurycomm. Retrieved 20 April 2016. ↑ "Games played by Leighton Baines in 2015/2016". Soccerbase. Centurycomm. Retrieved 1 May 2016. ↑ "Games played by Leighton Baines in 2016/2017". Soccerbase. Centurycomm. Retrieved 19 September 2016. 1 2 "Baines, Leighton". National Football Teams. Retrieved 20 April 2016. 1 2 3 "L. Baines". Soccerway. Perform Group. Retrieved 20 April 2016. Wikimedia Commons has media related to Leighton Baines.